Celebrating the heritage of our community and its commitment to lifelong learning. 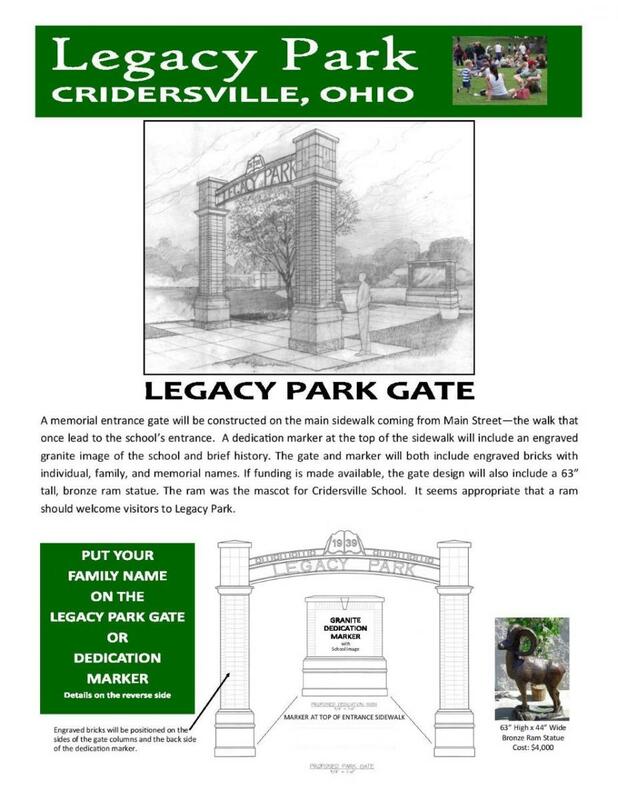 The Village of Cridersville and our local Lions Club and Historcial Society are partnering to develop a wonderful park on the site of our former Cridersville School at 300 E. Main Street. We invite you to learn more about the project and hope you will want to become involved. Legacy Park is a big project. Making it happen will take several years and many good people. The Village of Cridersville now owns the former school site. The Cridersville Lions Club has agreed to manage the logistics of a capital campaign and construction phases. The Cridersville Historical Society will serve as fiscal agent for the project. Plus, it will provide all of the required historical information. This project needs the help of local citizens, families, and businesses. It will also seek support from Cridersville School alumni now living throughout the country. The Village will seek grants to help with funding. We will also seek in kind-labor and materials for the project. It will take all of us, working together to make Legacy Park a reality. This is a major project for the Cridersville community. As with all big, meaningful projects it will take time, money, and a lot of community support and involvement. But, the benefits to our residents-especially our children-could be wonderful. THE COMMONS - a large open lawn defined by a circular walking path. It will become the perfect spot for active play and impromptu games. Plus, it will be great for lawn-chair seating for concerts and outdoor movies. THE CIRCLE WALK - a gaint circular walk that will define the Commons and provide a great place to walk, or maybe even jog. Plus, there will be plenty of benches along it for just sittin'. THE ONE ROOM SCHOOL SHELTER HOUSE - an open-air shelter house designed to resemble Cridersville's orginial one-room schoolhouse. It will provide space for family picnics, a staging area for concerts, and an optional screen for outdoor movies. It will also be the location for restrooms. THE SPLASH PARK - the place to find relief from the summer heat. The Splash Park will allow kids and their families a bit of water fun. The design calls for water jets to come out of the concrete walks and plenty of seating for "older" folks to enjoy the show. Its design theme will interpret Cridersville's Big Fire of 1918. Water cannons will simulate fighting the fire. THE OIL BOOM MAZE & FLOWER GARDEN - a fun and exciting maze with garden elements that resemble oil derricks, low-maintenance landscaping, and plenty of seating. It will be designed to tell the story of Cridersville's oil boom years. THE LEGACY GATE - remembering this site's importance to our childern, families, and community. An entry gate along the school's original sidewalk will be constructed from bricks and architectural elements saved from the former building. 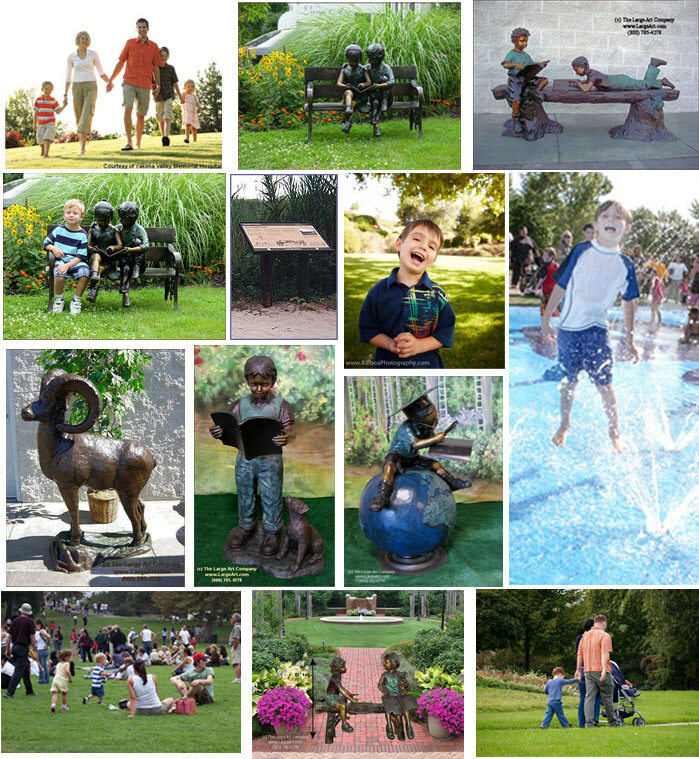 At the entry, and other locations in the park, there will also be life-size bronze statues of childern learning-the true legacy of the site. TELLING THE STORY - taking every opportunity to celebrate the heritage of our community. The park will be filled with design elements and interpretive signs that highlight local history. From the Shawnee trail that became Main Street to the founding by Ephraim & Polly Crider, the coming of the railroad, and much more. Legacy Park will tell the story of Cridersville's past and make it fun. WE HOPE YOU WILL WANT TO BECOME PART OF THIS IMPORTANT PROJECT! Legacy Park "Buy a Brick" Fundraiser - Individuals, families and businesses can support the Lagacy Park project by purchasing an engraved brick. The bricks will be built into the Legacy Gate and other structures of the park landscape. Download Legacy Park "Buy a Brick" Order Form & Info here. As a 501(c)3 not-for-profit, charitable organization, your donations are fully tax deductible.